Equestria Gaming had a long break. A visible decline all throughout 2014 with the final abandonment in 2015. Of course it was not because nothing was happening, so this segment, The Forgotten Era, is to shed light onto the news that never got covered during this time. Won’t it be a bit pointless to report on months and potentially years old material? Perhaps it is, but it shows respect to the creators who couldn’t get their hard work out into the world and show a broader audience what they have achieved, while this outlet was out of commission. These are not going to be done in any specific order. Just random picks from the backlog, rather that any sort of attempt at doing these chronologically. Our list is only covering what I imagine to be a fraction of the last year’s happenings, so feel free to send in any news and whatnot that never got their chance to get covered here. Now without further ado, let’s have a look at the first entry to this recurring segment. ZiggyLungStudios has been working on a 2D action-platformer parody of Castlevania: Order of Ecclesia and has been in the works since around 2012 and they have recently released a final demo. This game allows you to create your own pony and race, with each race having a fun and different gameplay style as you traverse through 6 enjoyable stages. While the game is not entirely complete, it's definitely worth looking at it! After years of hard work, Rise of the Clockwork Stallions has been released, you can play as more thank 40 characters with unique abilities and shoot, jump and explore through 70 levels! There are also a ton of secrets, easter eggs and other bonuses hidden around the world of Equestria! This game is unique because it is a game which is played with the youtube video player! Depending on what options you chose, the outcomes will be different. It's not something that has really been done before and it's definitely worth taking a look! You do need a computer with annotations enabled to play, however. My Little Karaoke has gotten another overhaul which incorporates a huge amount of content and improvements including an new online installer, making it easier to download or update the game, more than 110 new unique song, an updated theme and a faster release cycle for new songs. New Battle Gem Ponies Demo Released! Nia is a third person adventure-based puzzle experience and has recently gotten greenlit on Steam. It has some great gameplay, heaps of neat puzzles and dazzling lighting thanks to the Unreal Engine! They've released a trailer and in addition a demo that you can try! This game is a 2d platformer inspired by Rayman Legends. A new trailer has been been released showing off a cute cutscene as well as some very impressive gameplay, be sure to check em out and to give them some support! 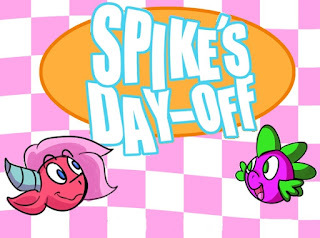 Spike's day off is a short game created for a game jam, you have one real objective and the game is really short, but it's definitely worth taking a look and the art style is so adorable!